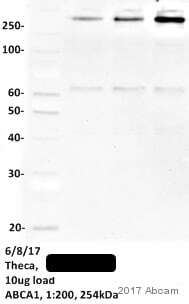 Knockout Tested Mouse monoclonal ABCA1 antibody [AB.H10]. Validated in WB, ELISA, IHC, Flow Cyt, ICC/IF and tested in Mouse, Rat, Chicken, Cow, Human. Cited in 81 publication(s). Recombinant fragment corresponding to Human ABCA1 aa 1800-2260. Our Abpromise guarantee covers the use of ab18180 in the following tested applications. IHC-P 1/200. Perform heat mediated antigen retrieval before commencing with IHC staining protocol. WB 1/200 - 1/500. Predicted molecular weight: 254 kDa. Abcam recommends using BSA as the blocking agent and 80-100 ug of lysate. Direct ELISA, where a 96-well plate was coated with recombinant ABCA1 C-terminal protein. The antibody was then added to the wells and a goat anti-mouse IgG HRP conjugate was used for colour development. 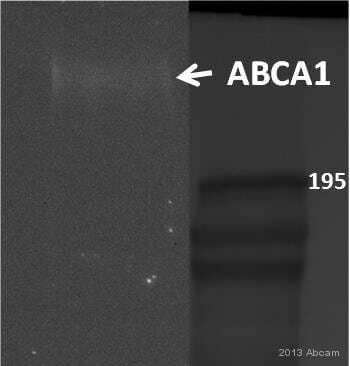 For ABCA1 quantification, a pair of anti-ABCA1 antibodies should be used to formulate a Sandwich ELISA and with a presence of an ABCA1 protein Standard. Optimal dilution to be determined by the end user. Widely expressed, but most abundant in macrophages. Defects in ABCA1 are a cause of high density lipoprotein deficiency type 1 (HDLD1) [MIM:205400]; also known as analphalipoproteinemia or Tangier disease (TGD). HDLD1 is a recessive disorder characterized by absence of high density lipoprotein (HDL) cholesterol from plasma, accumulation of cholesteryl esters, premature coronary artery disease (CAD), hepatosplenomegaly, recurrent peripheral neuropathy and progressive muscle wasting and weakness. Defects in ABCA1 are a cause of high density lipoprotein deficiency type 2 (HDLD2) [MIM:604091]; also known as familial hypoalphalipoproteinemia (FHA). HDLD2 is inherited as autosomal dominant trait. It is characterized by moderately low HDL cholesterol, predilection toward premature coronary artery disease (CAD) and a reduction in cellular cholesterol efflux. Multifunctional polypeptide with two homologous halves, each containing an hydrophobic membrane-anchoring domain and an ATP binding cassette (ABC) domain. Phosphorylation on Ser-2054 regulates phospholipid efflux. Palmitoylation by DHHC8 is essential for membrane localization. Western blot analysis of ABCA1 induction by cholesterol (+) in human fibroblast cells from different patients (1,2,3,4). Simultaneous bloting with anti-actin antibody was used for protein loading control. Western blot analysis of ABCA1 induction by cholesterol (+) in human fibroblast cells from different patients (1,2,3,4). Simultaneous blotting with anti-actin antibody was used for protein loading control. Overlay histogram showing HepG2 cells stained with ab18180 (red line). The cells were fixed with methanol (5 min) and then permeabilized with 0.1% PBS-Tween for 20 min. 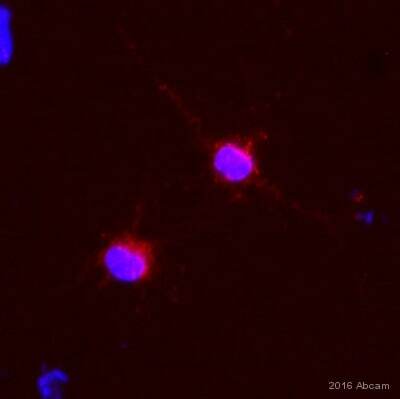 The cells were then incubated in 1x PBS / 10% normal goat serum / 0.3M glycine to block non-specific protein-protein interactions followed by the antibody (ab18180, 2µg/1x106 cells) for 30 min at 22°C. The secondary antibody used was DyLight® 488 goat anti-mouse IgG (H+L) (ab96879) at 1/500 dilution for 30 min at 22°C. Isotype control antibody (black line) was mouse IgG1 [ICIGG1] (ab91353, 2µg/1x106 cells) used under the same conditions. Acquisition of >5,000 events was performed. This antibody gave a positive signal in HepG2 cells fixed with 4% paraformaldehyde/permeabilized in 0.1% PBS-Tween used under the same conditions. Lysates/proteins at 100 µg per lane. The lower bands are from the secondary anti-mouse antibody reacting to the endogenous mouse antibodies from the tissue. Immunoreactivity of pancreas tissue for ABCA1 protein. Left panel: strong immunopositivity of exocrine glandular cells of the pancreas, especially in the basal region (arrows). Interstitial microvascular cells are apparently negative. Cells within the islet were weakly positive (data not shown). Right panel: the negative control. Hematoxylin counterstain. Publishing research using ab18180? Please let us know so that we can cite the reference in this datasheet.